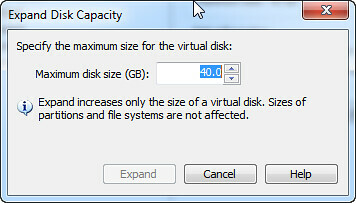 I occasionally need a larger disk in one of my VMWare VMs, and I always forget how to do it. I’m writing this post to save myself time the next time I need to do it! 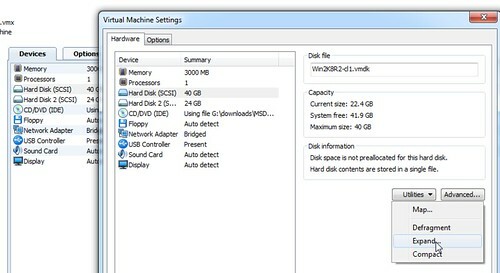 Problem: You need a larger disk in one of your VMWare VMs. Note: You can’t extend volumes in VMWare if the VM has any snapshots. Shut down the guest OS. 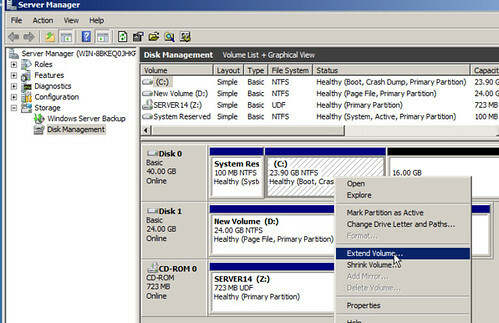 Start up the guest OS, log on, and start server manager, then select Storage | Disk Management. 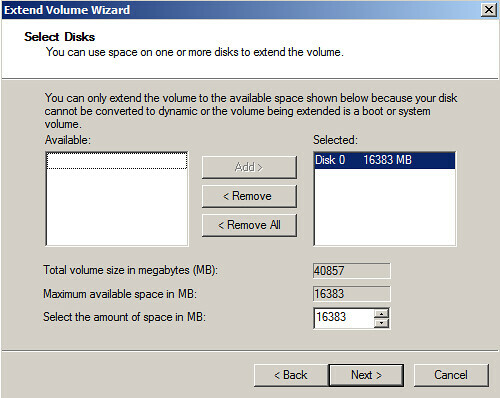 Notice the partition you just expanded now shows extra available space. Right click the drive and select Extend. Bask in the joy that you don’t have to fool around with building a new VM with a larger hard disk. Problem: Internet Explorer 8 won’t clear out authentication credentials and keeps signing you on to a site with a set of undesired creds. 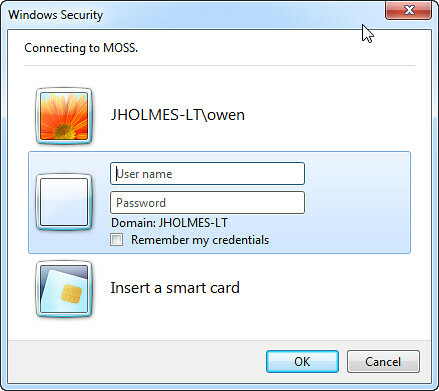 In this instance, you’ve likely told Internet Explorer to remember a user’s logon creds for a site with Windows authentication turned on. You want to log on to that same site with different user credentials, but you can’t get IE to bring back up the user logon dialog. Clearing out all browser data (Tools | Internet Options | Browsing History | Delete | check all boxes, clear Preserve favorite website data) doesn’t solve the issue. Solution: Use Fiddler to delete the browser’s cookie header. Start Fiddler and use Tools | Automatic Breakpoints | Before Request. Open IE and navigate to the bothersome site. Click on the last entry in the sessions pane, then right click on the Authorization cookie in the right Headers pane and select Remove Header. 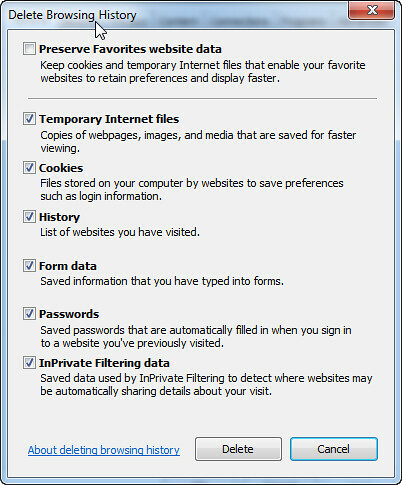 Flip back to IE and clear out all browser data again (Tools | Internet Options | Browsing History | Delete | check all boxes, clear Preserve favorite website data) . Now switch back to Fiddler and click Run to Completion in the lower left pane. At this point you should be presented with the familiar login dialog. 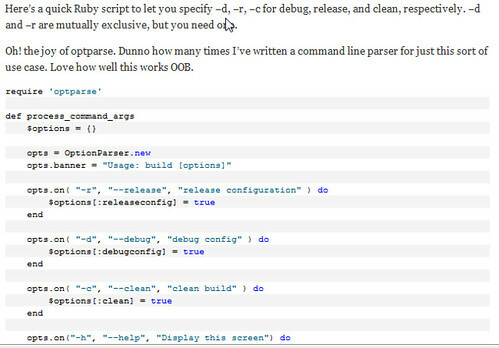 Problem: Your code snippet fomatting in Blogger looks like poo – extra line breaks “helpfully” injected by Blogger leave your snippets with more whitespace than a third grader’s resume. Solution: From a forum post by Daniel Carrarini on MSDN: Go to your Blogger’s control panel and select Settings | Formatting. Then change Convert Line Breaks from Yes to No. Repeatedly typing out msbuild command lines with configuration switches (release, debug) and clean/regular, FTL. Here’s a quick Ruby script to let you specify –d, –r, –c for debug, release, and clean, respectively. –d and –r are mutually exclusive, but you need one. Oh! 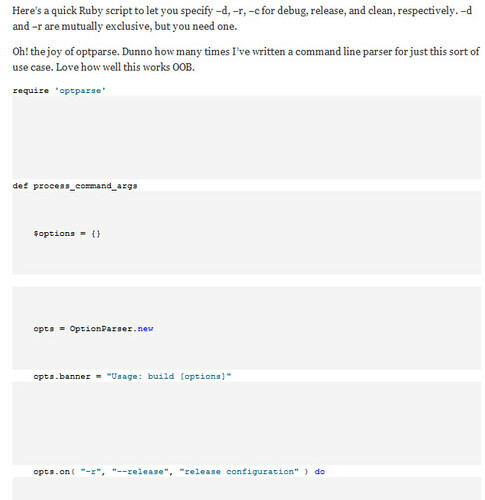 the joy of optparse. Dunno how many times I’ve written a command line parser for just this sort of use case. Love how well this works OOB. opts.banner = "Usage: build [options]"
puts "Red pill or blue, your choice. Try -d or -r.ac"
puts "Make up your mind: release OR debug, not both"
puts "More than one .sln file here. Can't figure it out, bailing." If you want an effective project team, then you need to ensure everyone on the team is able to make the right things happen. This is especially important on projects which are in critical phases or are suffering through a painful spot with your clients/stakeholders. You can’t get through tough spots in a project if members of that team have to constantly run back to their supervisory chain to get approval for every decision, or if they can’t help you get roadblocks out of the way. I’ve run in to this a couple times in my career, and it’s never pleasant. You need someone to bust through impediments, and instead you’re saddled with someone who never delivers on anything because they can’t make anything happen. The Meeting Guy may be a wonderful, happy person, but at the end of the day they’re an impediment to the success of your project. Having The Meeting Guy on your team is frustrating because your project’s progress suffers. Worse yet, this may be a dangerous sign of a lack of commitment from your client or stakeholder: they may not care enough about the project to fully support it. The worst of all situations might have someone seeking to actively sabotage the effort by saddling the project with a Meeting Guy – thankfully a situation I’ve never run in to. Sometimes it’s obvious right away if The Meeting Guy is on your team; other times it may take a few iterations/releases/weeks or an outright crisis to unmask the person. Daily standups are the biggest help in determining if you’re saddled with a Meeting Guy. Is someone on the team regularly missing commitments with reasons like “I’m waiting on <x> to give me approval for <y>,” or “We’re blocked on that while I coordinate with <z>?” Potential Meeting Guy. Note that I said “regularly.” Stuff happens, and not everyone can get every roadblock instantly out of the way. Meeting Guys/Gals are repeat offenders. There are no easy answers when you’re stuck with The Meeting Guy. You have to get communication flowing to find out what the real issue is – because The Meeting Guy is a symptom, not a root cause. Never, ever approach these conversations with a demanding mindset or tone. Yes, you need to clearly identify impediments and risks, but you can’t slip over in to metaphorical hostage taking or blackmail! These are tough conversations to have with the people and organizations responsible for the project, but you must have them. Something is preventing you from delivering the best business value to the client/organization/stakeholders. Find the root cause, solve it, and focus on helping your organization/clients get the best value for their money!